Talisker Beach offers you a calm and relaxed visit with its smooth sandy shore and the musical voice of the hitting waves. This grey sandy beach is surrounded by impressive cliffs, making an interesting landscape for a perfect photograph. Situated on the West Coast of Skye near the village of Carbost, the beach is also near to where the famous ‘Taslisker’ whisky is distilled. On a warm sunny day the sand can become comfortably warm under foot offering you an ideal opportunity to take your socks & shoes off and go for a paddle. You can also try swimming here. 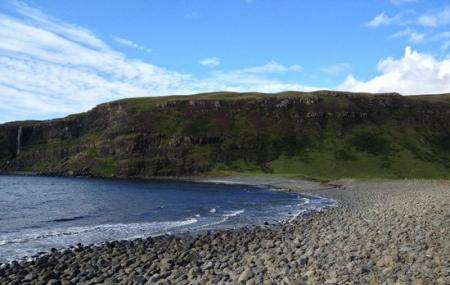 Try the 20 minutes Talisker Beach walk, suitable during all weathers. On very high tides all the sand will be coved by the sea, so if you are planning to take children to play on the sand, choose a time when the tide is lower. Tide times can be found on the Easy Tide Prediction website. Nearest bus stop is in Carbost 6 kilometres from start of walk. How popular is Talisker Beach? People normally club together Talisker Distillery and Oyster Shed while planning their visit to Talisker Beach.